Please fasten your seatbelts: the most powerful ŠKODA OCTAVIA in the company’s history is on its way. The new ŠKODA OCTAVIA RS 245 delivers 180 kW (245 PS) – this is 11 kW (15 PS) more than the previous top-of-the-range RS variant had to offer. The powerful engine and innovative chassis technology including the electronically regulated VAQ limited-slip differential offer the ultimate driving experience. The powerhouse is available as a hatchback or an estate and will be celebrating its world premiere at the 87th International Motor Show in Geneva. The compact sports car accelerates from 0 to 100 km/h in just 6.6 seconds (Combi: 6.7 seconds); its top speed is limited to 250 km/h. As is usual for a ŠKODA, the car features a spacious interior and luggage compartment. In addition, the latest driver assistance systems are also available for the ŠKODA OCTAVIA RS 245. Using the infotainment system, the occupants can be ‘always online’ thanks to the optional Wi-Fi hotspot and LTE module. Numerous ‘Simply Clever’ features are further testimony to the compact car’s practical talents. 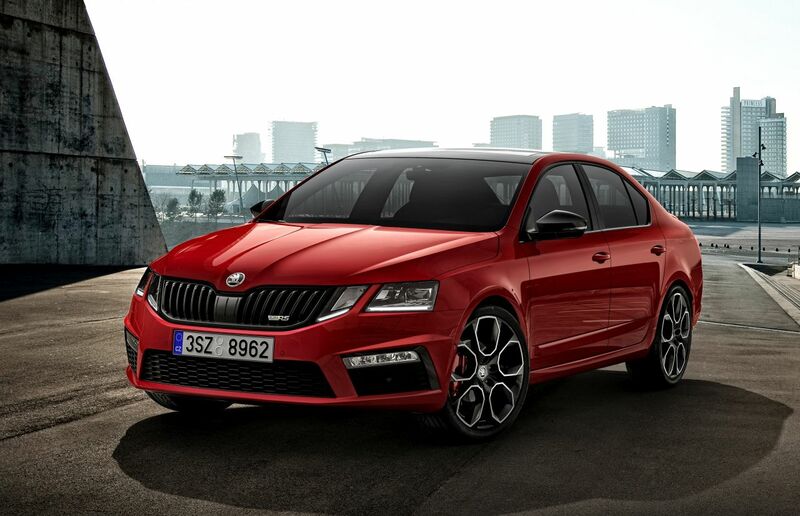 The ŠKODA OCTAVIA RS 245 features the new face of the brand and has particularly sporty design details. The completely new front section with wider radiator grille and the wide honeycomb air inlets in the redesigned bumper provide the ŠKODA OCTAVIA RS 245 with a masculine and dynamic appearance. The slats on the radiator grille and the trim that frames the radiator grille both come in gloss-black. The redesigned headlight clusters in a crystalline look feature full-LED technology and AFS adaptive front headlights as standard. The fog lights, tail lights and number plate illumination also feature LED technology and a crystalline appearance. The exterior mirror housings and the trapezoid tailpipes are also black. The radiator grille and the tailgate both sport the RS logo featuring a gloss-black ‘V’ (for victory). Features such as the spoiler at the back of the hatchback or roof spoiler on the Combi are further attributes of the car’s emotive and sporty design. The ŠKODA OCTAVIA RS 245 can also be recognised as a high-performance sportster acoustically thanks to the husky sound of its exhaust system. The sporty look also dominates in the interior, which has also been designed largely in black – from the roof lining to the footwell including its silver-coloured pedals with an aluminium finish. With their high sides and integrated headrests, the Alcantara sports seats provide maximum support in fast corners. The front seats bear the RS logo – as do the front door sills. The multifunctional sports steering wheel with perforated leather and integrated steering wheel paddles (for DSG transmissions) matches the car’s dynamic ambience. The LED ambient lighting in the RS-245-specific decorative trims immerses the interior in one of the ten choices of colours. A colour Maxi-DOT display forms part of the instrument cluster. The ŠKODA OCTAVIA’s top-of-the-range model has a 180-kW (245-PS), four-cylinder, TSI petrol engine under its bonnet – that’s 11 kW (15 PS) more than its predecessor had to offer. Maximum torque of 370 Nm is achieved between 1,600 and 4,300 rpm. There is a choice of a 6-speed manual gearbox or – for the first time in a ŠKODA OCTAVIA – a 7-speed, dual-clutch transmission. From a standing start, the hatchback reaches 100 km/h in 6.6 seconds; the Combi does it in 6.7 seconds. In addition, the engine’s flexibility is particularly impressive. When accelerating quickly in the two highest gears on a country road or motorway, the high-end ŠKODA OCTAVIA instantly delivers power. In fifth gear, the ŠKODA OCTAVIA RS 245 with a manual gearbox can manage the short burst from 60-100 km/h in just 6.4 seconds (Combi: 6.5 seconds), 80-120 km/h takes only 6.6 seconds (Combi: 6.8 seconds) – a reassuring safety buffer. The ŠKODA OCTAVIA RS 245 bristles with emotion and dynamism. In the compact car segment, it provides exceptional value for money for sporty and ambitious yet practical, down-to-earth drivers. 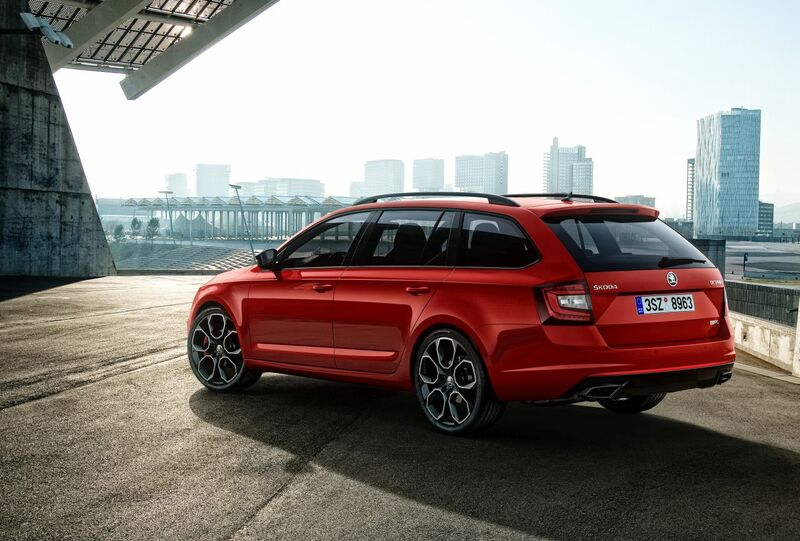 Compared to the ‘normal’ models in the range, the sports chassis lowers the body of the ŠKODA OCTAVIA RS 245 by 14 mm. Its rear track is 38 mm wider than that of the predecessor. The standard, gloss-black alloy wheels are 19 inches in diameter. The ESC stability system with Sport mode, as well as the electronically regulated VAQ limited-slip differential are also part of the standard equipment. This electronic inter-wheel lock for the differential on the driving wheels allows for particularly dynamic acceleration when exiting corners: the amount of slip on one of the front wheels is limited and transferring power to the road is optimised. The electronically regulated VAQ limited-slip differential will remain a distinctive feature of the RS 245 model. Performance Mode Select with the Performance Sound Generator function enables individual adjustment of drive, chassis and comfort settings. The dynamic character of the ŠKODA OCTAVIA RS 245 is additionally highlighted by the car’s progressive steering and the optional adaptive Dynamic Chassis Control (DCC). 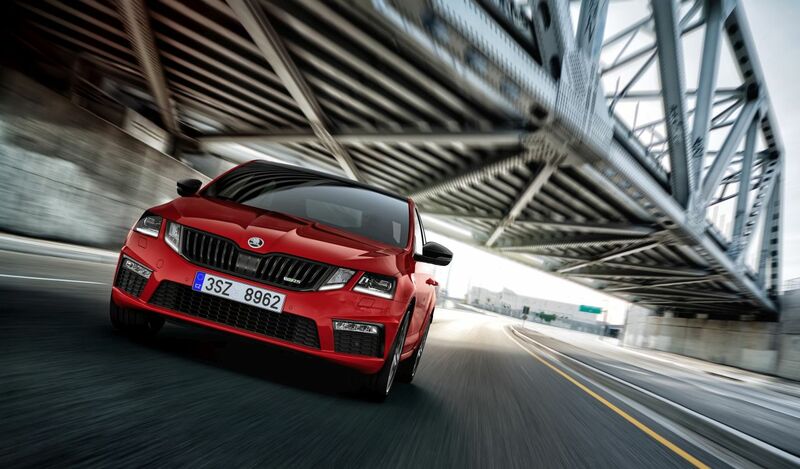 ŠKODA Connect offers pioneering mobile online services divided into the two categories of Infotainment Online (information/entertainment) and Care Connect (driver assistance). The controls for the new generation of infotainment systems are integrated in a glass design for the Bolero, Amundsen and Columbus versions and, with their capacitive touch screens, react even to a light touch; in the ŠKODA OCTAVIA RS 245, they display a special start screen. The top-of-the-range Columbus navigation system features a 9.2-inch screen and an optional LTE module for super-fast data transfer, and provides occupants with a Wi-Fi hotspot. One of the particularly helpful services is Online Traffic Information, which offers recommended alternatives to the chosen route in the event of a traffic jam. In the Columbus system, destinations can be entered via voice control using the POI (Point of Interest) search. The system also provides news and information on the weather, petrol stations along the route (including fuel prices) or parking spaces. A Phonebox charges smartphones inductively. Further online services are offered by the ŠKODA Connect app on a smartphone. By using the Remote Access feature, windows, doors, the sunroof and lighting can be controlled, the fuel level can be checked, or your parking location can be displayed. Care Connect also allows an Emergency Call to be made (automatically in the event of an accident in which restraint systems have been activated). The system alerts your breakdown service at the touch of a button and connects the driver to experts who can answer any questions regarding vehicle functions. The electronic assistance systems surpass the usual level of the compact car segment by far. Newly available features include Trailer Assist (which steers and brakes the car and trailer when reversing), Predictive Pedestrian Protection (which brakes in the event of an impending collision with pedestrians) as a component of Front Assist, Blind Spot Detect (which warns of any vehicles in the blind spot), Rear Traffic Alert (its rear sensors warn the driver of approaching traffic when reversing out of parking spaces), Manoeuvre Assist (which brakes the vehicle as soon as the sensor detects an obstacle when moving forwards or reversing) and Crew Protect Assist (which closes the windows and sunroof in the event of an impending collision and tensions driver and passenger seatbelts). Crew Protect Assist works in conjunction with Front Assist including the City Emergency Braking function. In the ŠKODA OCTAVIA RS 245, the proven Adaptive Cruise Control ((ACC), which helps the driver to maintain the selected speed and the desired distance from the car in front) can be activated up to a speed of 210 km/h. The numerous ‘Simply Clever’ features in the new ŠKODA OCTAVIA RS 245 include special bottle holders in the centre console (allowing PET bottles to be opened with one hand), a heated steering wheel, two USB ports in the rear, a personalisable key (allowing up to three users to programme their individual settings for the air conditioning, seats, the audio system’s volume and Driving Mode Select) and a removable LED torch in the boot of the Combi; the battery of the torch will recharge automatically while driving. ŠKODA used the abbreviation RS for the first time in motorsport in 1974. In 2000, the synonym of sportiness entered the ŠKODA model range. This marked the beginning of the success story. 200,000 RS models have been sold to date – a whopping 100,000 of which are third-generation OCTAVIAs and have been sold since 2013. Jeder zweite hier im forum hat mehr leistung. Den Spruch hätten sie vielleicht bringen können, wenn sie die motorgetriebeantriebskombi vom Leon cupra 300 verbaut hätten. Es ist aber leider so das der RS wohl nie mehr Leistung als der GTI/Performance haben wird. Für alles darüber ist Seat zuständig. Der GTI hat doch auch bloß 245?! Der GTI hat aktuell nach Facelift 230 PS, es soll aber der Facelift Performance kommen dann ebenfalls mit 245 PS! Leben, wo andere Urlaub machen. Willkommen im Allgäu! wie kommst du auf 10 000€? gibt es zum RS FL Modell mit 245PS schon weitere Informationen? Ja, gibt es! Hab extra in Tschechien angerufen und nachgefragt. Ich fahre nämlich gerne Bus. Da muss man beim Parken nicht immer an die Frontschürze denken und Frau & Kind meckern nicht ständig weil der Wagen hoppelt wie ein Karnickel. Die Inneneinrichtung fängt erst später an zu klappern weil es weniger Erschütterungen gibt. Die gesamte Glühobst-Abteilung (incl. LED) hält länger (die mögen auch keine Erschütterungen). Gut, im Winter muss ich auf den Räumdienst warten, da ich mit dem hohen Busfahrwerk den Schnee nicht selbst wegschieben kann. Dafür sitzt man Deutlich höher! Da muss man nicht überlegen, ob man auf den Kodiaq umsteigt! Ein hoch auf das Busfahrwerk! Daher habe ich jetzt trotz der 4 Augen den RS245 auf dem Schirm. Ich hoffe das hier auch noch etwas am Auspuff überarbeitet wird, denn hier kann der neue Cupra (ab 290) für mich sehr stark überzeugen. Der RS245 hat die gleiche AGA wie der RS230. Zusätzlich die Vorderachsquer-Sperre. Sitze sind die gleichen wie beim normalen RS. Alcantara/Leder. 7 Gang DSG und ein anderer Turbo wurden verbaut. Ich glaube das ist der IS38 aus dem Golf R.
ICh denke nicht, dass es ein Superb RS geben wird. Den aktuellen Superb bekommt man mit 280 PS und 4x4. Das sollte doch reichen. Fahre ja selbst Serienhöhe, aber auf den Bildern sieht das echt Katastrophe aus. Zumal meiner mit Serienfahrwerk lange nicht so hoch dasteht. Immerhin haben sie sich diesmal getraut die reale Fahrwerkshöhe zu propagieren und nicht irgendwelche getürkten Bilder zu nehmen. Ich weiß gar nicht, wo das Problem ist. So hoch sieht der RS245 doch gar nicht aus. Ich würde mir ihn auch etwas tiefer legen. Für den Großteil der Käufer, ist die Serienhöhe wohl OK. Ich spreche nicht von den Leuten aus diesem Forum. Soviel zum Thema das der RS245 in der Originalhöhe gezeigt wird So sollte es original sein. Der RS245 hat die gleiche AGA wie der RS230. Zusätzlich die Vorderachsquer-Sperre. Der RS 230 hatte auch schon die VAQ. Ja, aber hat der FL Standard-RS TSI, der ja jetzt ein 230er ist, die ebenfalls oder ist sie wieder dem stärksten Modell - also RS245 - vorbehalten? Gestern hab ich gelesen dass der neue Golf GTI Performance (eben auch mit 245PS) nur ein 6-Gang DSG bekommt und das 7-Gang nur dem Golf R vorbehalten ist. Hat schon jemand was gehört, ab wann der RS245 bestellt werden kann???? Wie sicher ist es, dass der RS245 einen anderen Turbo (in diesem Fall den IS38) bekommt? Octavia III V/RS 2.0 TSI DSG Combi MJ15, Candy Weiß, ACC, Businesspaket Traveller, elektr. Heckklappe, Kessy, beheizb. Windschutzscheibe, Sitzheizung hinten, Gemini Anthrazit, Ablage Paket, Black Design, Proaktiver Insassenschutz, Parklenkassistent. Wie sicher das ist, kann ich dir leider nicht sagen. Das hatte ich von meinem Freundlichen erfahren. Neuer RS kommt im April/Mai mit 245 PS ,bestellen geht schon. Bestellen geht schon bei meinem Händler ,werde aber erst mal Probe Fahren,mal sehen ob er genauso leise ist wie mein alter und gleich zu meinem Chip Tuner 340 PS 490 Nm 1000 .- Euro mit Eintrag in Papiere. Ich war gestern beim Händler und er kann bisher nur den mit 230 PS bestellen. Zum 245 hatte er noch nichts im System. Ich habe auch mit zwei Händlern gesprochen. Die können den RS245 noch nicht bestellen. @Racer RS Kannst du bei deinem Händler nochmal nachfragen, ab wann er bestellt werden kann. Meiner sagte was ab KW15. Danke für den Hinweis. Ich denke da hat er was falsch verstanden. Der RS245 wird jetzt in Genf vorgestellt. Die Messe geht bis zum 19.03. Es kann schon gut sein, dass man ihn dann Anfang April bestellen kann. Leider hat keiner verlässliche Informationen. Weiß denn jemand von euch, was sich beim 245er Innen ändert? Evtl. kleine Dinge, die man im Vorfacelift nachrüsten könnte. Die schwarzen Leisten vom 230er finde ich zum Beispiel sehr schick und wertiger, als die alten zu folieren. ...hat da einer von Euch schon eine Info zu?! Oh that is great. In germany maybe next week. Werde schon ganz nervös bei den aufgerufenen Lieferzeiten. Das wird nicht so krass sein. Ich denke länger als 6 Monate wird man hoffentlich nicht warten müssen. Möchtest du den RS245 bestellen? Doch, es soll der RS 245 werden. Ohne Panoramadach, DCC unentschlossen, Blackpaket (oder wie auch immer es heissen mag), Anhängerkupplung für den Fahrradträger, sonst "einmal mit alles". Wechsel auf Benziner, da sich mein Arbeitsweg durch Umzug auf 8,5km verkürzt hat und meine Aussendiensttätigkeiten stark abgenommen haben. Wie bisher Leasing incl. Wartung/Verschleiss. Habe in einem anderen Thread auch schon nach einer Händlerempfehlung gefragt, da unser (Firma) Stammhändler zu 99% VW und Audi verkauft (auch jetzt noch) und bei Skoda sehr unwissend war. Der "Big Player" im Raum Köln-Bonn hat es noch nicht einmal bei Firmenkunden nötig, Kundenfreundlich zu sein. Ich möchte mir ihn auch bestellen, sobald er verfügbar ist. Habe schon etliche Mal bei Skoda angerufen. Sie meinten...Ende der Woche gibt es Infos dazu. Der Berater meinte, es kann nächste Woche soweit sein. PW ist immer noch KW22. Nimm das DCC auf jeden Fall dazu Ich würde es jederzeit wieder nehmen In Kombination mit den Sportline genieße ich es wirklich die Option "Comfort" mal wählen zu können auf der Autobahn. Mein Bruder hatte das mal in einem Passat. Er hat es bei Abholung auf "Sport" gestellt und den Knopf die 3 Jahre Leasingdauer nie wieder angefasst. Ich habe mich schon gegen DCC entschieden. Möchte ein Gewindefahrwerk verbauen. Ob das die richtige Entscheidung ist, weiß ich aber nicht. Du hast ja schon Erfahrung @Maas. Hast du ein Foto von deinem DCC mit Sportline Federn?